From the world’s greatest classical musicians to young artists making their debut, Wigmore Hall’s 2017/18 Season promises to be accessible to more people than ever before. Situated in the heart of Marylebone, London’s Wigmore Hall is a unique venue to experience exceptional performances, set apart from other concert venues by the clarity of the acoustic in the iconic and intimate auditorium. Nowhere else in London can you get as up close and personal to the performers and musicians. If it is your first time visiting, or your five-hundredth time, the 2017/18 Season is packed with something for every musical taste. In announcing Wigmore Hall’s 2017/18 Season John Gilhooly, Director of Wigmore Hall, who is responsible for all areas of the Hall’s programming, commented: “Our partnerships with artists have never been stronger. Musicians love the atmosphere in the Hall, they love the intimacy, they love being able to communicate with everyone in the audience. This is reflected in the number of projects they are prepared to take on specifically for Wigmore Hall. Everyone at Wigmore Hall is deeply grateful to our many supporters who enable us to present such a rich, diverse and adventurous programme and for making all artists feel like they’re returning home”. Wigmore Hall has a strong history of supporting and profiling American classical artists. In past seasons the likes of mezzo- soprano Susan Graham and the Chamber Music Society of the Lincoln Centre have taken to the Wigmore stage. 2017/18 Season will be no different as the Hall is pleased to welcome some of the greatest American performers in the industry. 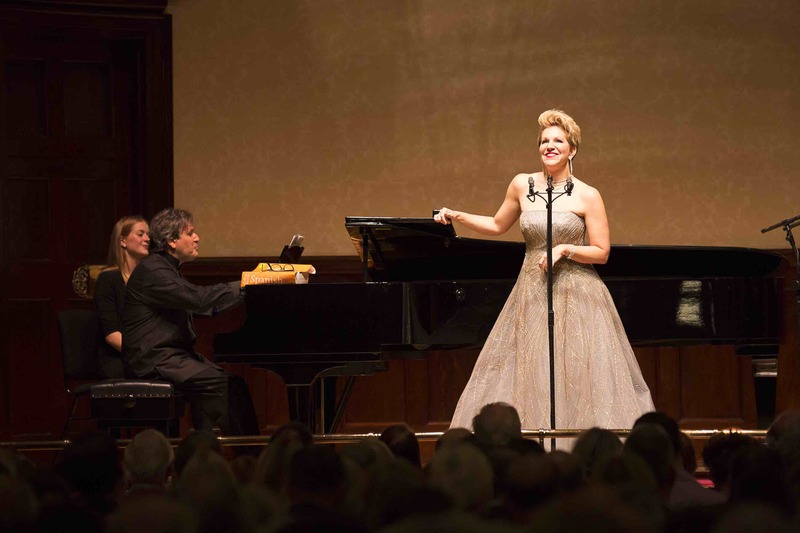 Joyce DiDonato, the acclaimed mezzo- soprano, will be performing a programme of Strauss and Debussy at Wigmore Hall this autumn, alongside the Brentano String Quartet. DiDonato will also be performing a piece written specifically for her by the American composer Jake Heggie that responds to the creative genius and tragic end of Rodin’s muse and lover Camille Claudel. DiDonato’s artistry and consummate professionalism promises to enthral the audience, and she will be sharing her experience and wisdom in a Masterclass a few days earlier. Violinist Joshua Bell stands among today’s great performers. He is renowned for impassioned music making and will be in London this season with the musicians of the Academy of St Martin in the Fields. Bell and the ASMF are uniting further in a performance at Wigmore Hall that will show the clarity and beauty of works by Bach and Tchaikovsky. Wigmore Hall welcomes the best of all instrumental performances and have a strong Jazz programme. For the last season, Jazz pianist, bandleader and composer Vijay Iyer has held a residency at the Hall. In the final concert of his series, Vijay is expanding his classic Trio with three great horn players to build the Vijay Iyer Sextet, for a concert not to miss. The extraordinary Dianne Reeves takes to the stage in March when she will be performing works from her GRAMMY Award- winning albums. Whatever your interest or experience of chamber music, there is something for every taste at Wigmore Hall. Click here to see what's on at Wigmore Hall this season. American Friends of Wigmore Hall was set up to strengthen classical music ties between the UK and the US. Funded by its membership, the organisation supports American artists and projects on both sides of the Atlantic, with a preference for those where there is a connection with Wigmore Hall. If you would like to support chamber music and song and international musical partnerships, please consider making a donation to American Friends of Wigmore Hall. American Friends of Wigmore Hall is a 501(c)(3) tax-exempt organisation (TIN 30-0125674). Donations to it are tax-deductible to the extent allowed by law. With Americans very much in mind, St Bartholomew the Great, one of the oldest and most beautiful churches in London, is presenting A Star-Spangled Christmas, a service of lessons and ‘American born’ carols by candlelight on December 20th at 6 pm, with mulled wine and mince pies to follow. Many Christmas carols that are thought of as part of an English Christmas began life in America and in time travelled across the pond. It came upon the midnight clear, O little town of Bethlehem, We three Kings of Orient are, Away in a manger, and Deck the Halls are all examples of American born hymns. Indeed, they are still sung in the United States to the original tunes with which they were accompanied when they were first enjoyed. The carol service will include carols written in America; and where there is an American tune for a familiar congregational carol, that is the one the church will follow. One of the most poignant tales about a carol’s origin, this one being O little town of Bethlehem, begins in 1865 when the Boston born Rev. Phillips Brooks (1835-1893) went on a pilgrimage to Israel. On Christmas Eve Brooks travelled on horseback from Jerusalem to Bethlehem where he marvelled at the views of the town and its surrounding fields. Filled with wonder, he was inspired to write this most loved Christmas hymn that imagines the tranquil atmosphere surrounding Christ’s birth. Brooks presented the hymn to his Sunday school, at Holy Trinity Church, in Philadelphia. In 1871, the hymn appeared in The Sunday School Hymnal. The 6’4” Brooks, reputedly a powerful preacher, eventually became the Bishop of Massachusetts. Indeed, it is reported that Brooks’ fine preaching was so renowned that he was invited in 1880 to preach at Westminster Abbey and at the Royal Chapel in Windsor before Queen Victoria. Several volumes of Brooks’ sermons have been published. St Bart’s is located in West Smithfield, an area with medieval origins within the City of London, the city’s financial district. As one walks along the neighbouring narrow cobblestone streets lined with Georgian and Victorian buildings, there is quite a Dickensian feel. The church was once part of a great Augustinian priory founded in 1123 by Rahere, a jester in the court of Henry I, in gratitude for the founder’s recovery from a near fatal illness he contracted while on a pilgrimage to Rome. A vision of St Bartholomew, which occurred in Rahere’s dreams, directed him to this location. The courtier’s tomb lies in the church. Rahere also established the world-renowned teaching hospital St Bartholomew’s, which is almost adjoining. The church has served quite enterprising purposes. The crypt has been used for storing coal and wine. The Lady Chapel was once three private houses and also a printer’s office where Benjamin Franklin worked in 1725. On other parts of the site, there have been stables, a blacksmith’s forge, a carpenter’s workshop and a hop store. John Wesley once preached at the church. The painter William Hogarth was christened there in 1697. Poet John Betjeman lived in a flat opposite the churchyard in Cloth Fair. In Betjeman’s opinion the church has one of the finest surviving Norman interiors in London. Many city livery companies are closely associated with the church. Indeed, it could be on a tourist trail as the church has been the location for scenes from the films, to name a few. The majestic aura of St Bartholomew the Great is quite stunning. The church seems vast, but it is actually only a shadow of its original self, having been subject to much destruction during the dissolution of the monasteries during the reign of Henry VIII, lack of maintenance throughout the ages, the changing fortunes of the church establishment and the demographics of the local community. St Bart’s has certainly undergone many architectural ramifications; it embodies architectural styles and artistry from over a thousand years. Indeed, in the entrance there is a gilded statue (on loan) by Damien Hirst of a flayed St Bartholomew, entitled “Exquisite Pain”. Hirst has commented about the statue, “as St Bartholomew was a martyr who was skinned alive, he was often used by artists and doctors to show the anatomy of the human body and this is also what I’ve done”. A few minutes’ walk from the church is Smithfield Market, the largest wholesale meat market in Britain and one of the largest of its kind in Europe. For over 800 years there has been a livestock market on this site. In the twelfth century the area was known for jousts and tournaments and in the thirteenth century for the execution of criminals. For centuries The Bartholomew Fair, three days of “debauched and drunken” merrymaking, dancing, selling and music, was a local highlight. You may buy your turkey and game for Christmas at the market, which is open from 2am, but do arrive before 7 am to have the most choice. There are monthly tours of Smithfield Market given by City Guides. Another historic treasure, ‘just around the corner’ is The Charterhouse, which was once a monastery, private mansion, and boys’ school before settling down to be the almshouse it is today. The residents, both male and female, are known as `Brothers’. One can visit the recently opened museum which tells the story of The Charterhouse, from the Black Death to the present, and also book a tour with a professional guide and see the Great Hall where the Brothers dine and The Great Chamber where Queen Elizabeth I held court during the beginning of her reign and more! One can also book behind-the-scenes Brothers’ tours, each one being from a unique perspective – no two tours will ever be alike. 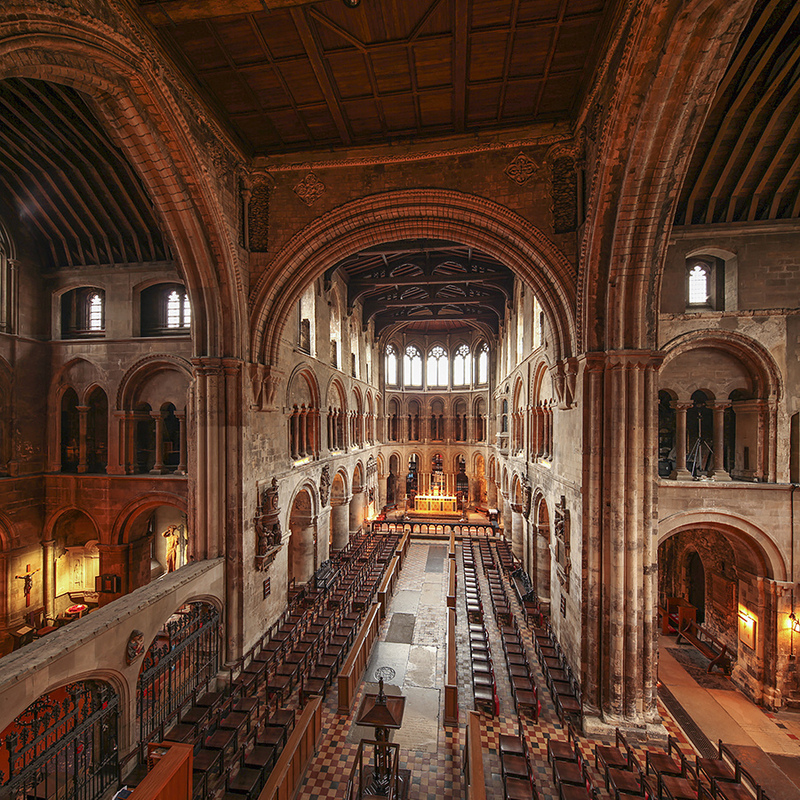 A visit to St Bartholomew the Great this Christmas will give you fresh perspectives on London’s history and open your eyes to a unusual area in the city, a little off the snowy track. The members of the regular congregation, which includes quite a number of Americans, are reputedly very friendly, too! And you will enjoy the carol singing immensely, and hopefully join in next year! Photo: St Batholomew the Great. Courtesy of Anthony Harbison.